Shyamji Krishna Varma was highly impressed with the work of Shri Lokmanya Tilak. He fully supported Tilak during the consent of Age Bill Controversy of 1890. Shyamji initiated very friendly relations with Tilak, which inspired him to the Nationalist Movement in the next decade. The timid and futile cooperative policy of Congress Party did not appeal to Shyamji. Lokmanya Tilak born as Keshav Bal Gangadhar Tilak on July 23, 1856, in a village near Ratnagiri, Maharashtra, into a middle class Chitpavan Brahmin family. 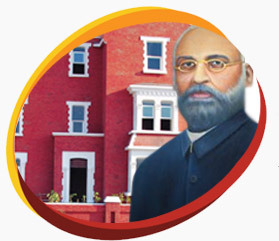 Tilak graduated from Deccan College, Pune in 1877. Tilak was among one of the first generation of Indians to receive a college education. Tilak joined the Indian National Congress in 1890. He opposed its moderate attitude, especially towards the fight for self-government. He was one of the most-eminent radicals at the time. Tilak was considered the political and spiritual leader of India by many, and Gandhi is considered his successor. At 52, Tilak wrote his famous commentary on Bhagavad-Gita, the sacred book of Hindus Geeta-Rahasya in the jail. He traveled constantly in order to organize the people. While fighting for people’s cause Bal Gangadhar Tilak died on August 1, 1920. July 01, 1909 - Madan Lal Dhingra, an Indian student closely identified with India House in London shot dead William Hutt Curzon Wylie, a British M.P. in London. July 19, 1827 - Mangal Pandey was born in the village of Nagwa, district Ballia, Uttar Pradesh. July 23, 1906 - Chandra Shekhar Azad was born in the Badarka village of Unnao district in Uttar Pradesh. July 23, 1856 - Bal Gangadhar Tilak was born in a village near Ratnagiri, Maharashtra, into a middle class Chitpavan Brahmin family. July 1934 - Sardar Vallabhbhai Patel was released. July 5, 2012 - Mr. K.C.Patel-Convenor of education cell -BJP visited the memorial. June 7, 2012 - Mr. Hitesh Pandya - Addl. PRO to CM. & National Chairman of lions club visited the Memorial from Gandhinagar and Mr. Akshay Thacker National Vice Chairman of lions club from Bhuj also accompanied. June 21, 2012 - Shri Narendra Modi Chief Minister of Gujarat visited the Memorial to inaugurate new Virtual Tribute Kiosk on the auspicious day of "Ashadhi Beej" dated 21st June 2012. Shri V.S. Gadhavi, IAS - Principle Secretary, Govt. of Gujarat and Managing Director of G.M.D.C. was also accomplished them.